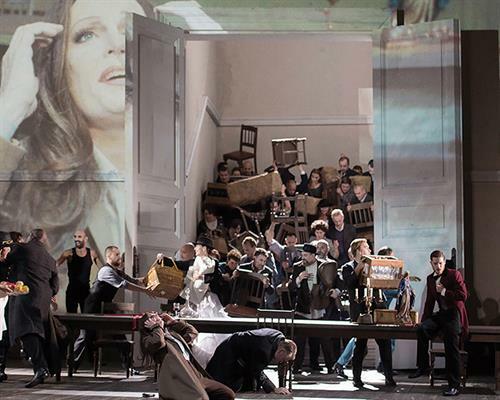 The 2019 Live Cinema Series continues at Gesa Power House Theatre with a screening of the current Royal Opera House production of "La forza del destino" on Sunday, April 28 at 1:00 p.m. The 2019 Live Cinema Series continues at Gesa Power House Theatre with a screening of the current Royal Opera House production of "La forza del destino" on Sunday, April 28 at 1:00 p.m. This production is filmed live in London and rebroadcast internationally to select screens. Leonora falls in love with Don Alvaro, but when her father forbids their marriage, a fatal accident triggers a drama of obsession, vengeance and tragedy. Jonas Kaufmann and Anna Netrebko star in Verdi’s epic "La forza del destino" (The Force of Destiny) an opera which demands the very best of singers for its powerful music and the fullest theatrical treatment for its story of bitter revenge pursued across miles and years. This screening runs approximately 4 hours 15 minutes including an onscreen introduction and two intermissions. "La forza del destino" is performed in Italian with English surtitles. Beer, wine, popcorn, and snacks will be available for purchase, and may be taken into the theater. Reserved seating tickets ($15 Adults, $10 Students) will go on sale to the public on Thursday, March 14, online at www.phtww.com or by calling the box office at 509-529-6500. For group ticket sales, please call 509-876-1662. Sunday, April 28 - 1:00 p.m. to 5:15 p.m.